Things are warming up quickly, but the nights are still chilly. The temp in my greenhouse got down to 31 degrees the other night. I’ve been running a shop light in it, but it’s been making a 3 degree difference at best. The first thing I thought of was adding some buckets of water. The idea is that the sun heats the buckets of water, the water slowly sheds the heat as the sun goes down. I know that the buckets will release heat too quickly just using the sun to heat them. I was hoping the shop light would stretch their heating properties. Perhaps I didn’t use enough buckets. By 10pm, the temp was 1 degree higher than outside. Bummer. My next thought was to get the greenhouse warmer during the day, so that everything in the greenhouse would take longer to drop below 40 degrees. I added a solar blanket. I got this idea from a show called “Dual Survival”. The idea is that any radiant heat is reflected off the solar blanket back into the greenhouse rather than out the back side. These solar blankets are cheap. I ordered 10 for $1 each a year or two ago. The high hit 89 degrees within the greenhouse. The temp in the sun outside at the same time was 62. Conditions still dropped too much at night. Unfortunately, this is a temporary setup. I’m not willing to invest in anything like a heat pump. I’ll have to use an electric heater if I want to keep things above 50 degrees. 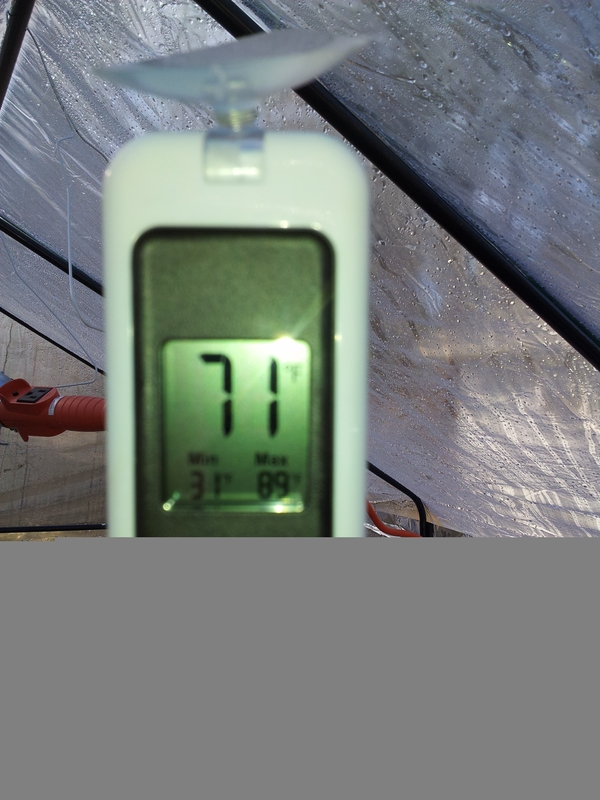 This entry was posted in Buildings/Structures and tagged greenhouse, solar blanket, temperature by admin. Bookmark the permalink. I saw a setup where a guy built a plywood box tall enough to house 3 60 watt bulbs in porcelain bases; the lights would heat up the box and all the plant starts would sit on the box keeping their soil warm. The box was on a table so that the working height was comfortable and the whole thing was in a green house. Thanks for the input, Francis. That sounds like a good plan once I build a more lasting greenhouse. I ended up adding a couple more heat lamps. They are getting the job done for now. design anԁ style seеms different thеn moѕt blogs anԁ I’m loоking for somеthing сompletely unіque. I’m using WordPress 2011, but I’m hoping to provide a new look and feel in a couple months. Stay tuned! I’m excited to find this great site. I wanted to thank you for ones time due to this fantastic read!! I definitely appreciated every part of it and I have you book marked to see new stuff on your blog. I am working on the same problem, keeping a growing bed in a 14 X 20 greenhouse at a temperature at night that will promote the growing of produce. 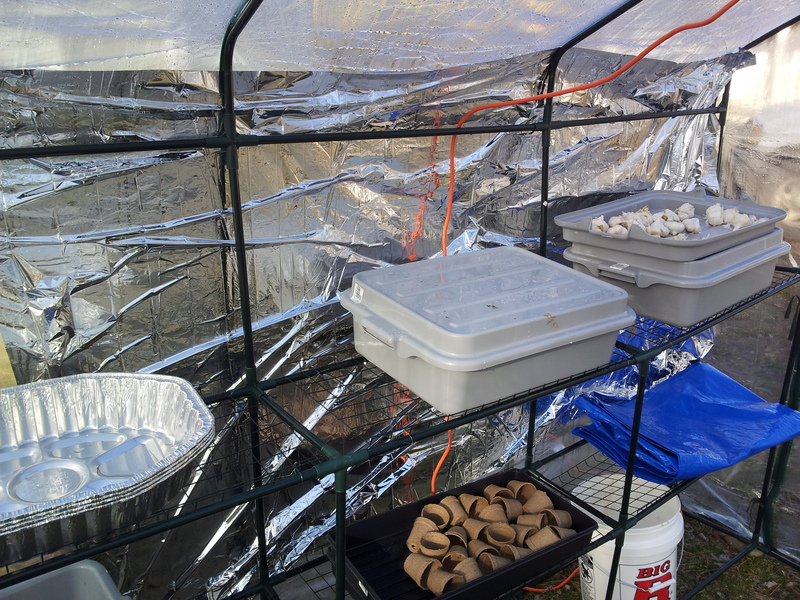 After using propane (non renewable) for two years I decided to heat only the growing bed. The bed is 4′ X 8′ and the objective is to grow fresh food for the winter months. We live at 6,000′ in SW New Mexico, the high desert. Average nightime temperatures can be in the 20s with occasional dips to the lower teens. Objective – use as little non-renewable resources as possible, preferably use NO non-renewable resources in order to grow food. 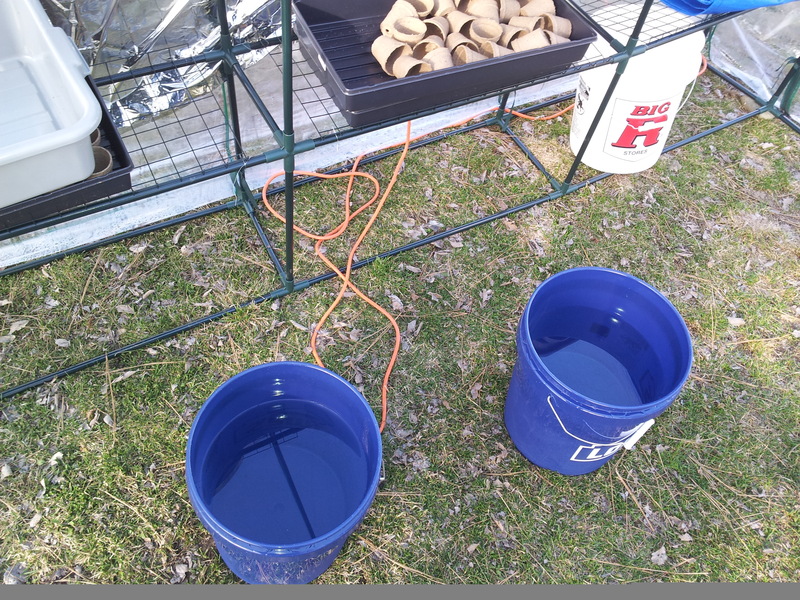 My current working solution is solar heated water circulated through 2 – 55 gal. drums during the day using a direct 24VDC pump. I had a 24VDC PV panel and found two 4′ X 7′(?) flat plate collectors, one I needed to fix a small leak. This system will not use a heat exchanging tank nor have glycol. This will be a simple ‘drain down’ system with the water in the collectors draining by gravity into the barrels when the pump quits at sundown. No freezing problem. The barrels will be under the raised bed which will have a skirt to hold the heat under the bed. G, sounds like a good plan. Just so I understand, the system is open, or has air in it, so that the only way water can be up in the warming barrels is if the pump is running. The pump stops pumping when there’s no light (no solar to power it) and the water drains down, leaving only air exposed to the warming barrels that will be cooling. Does that sound right?